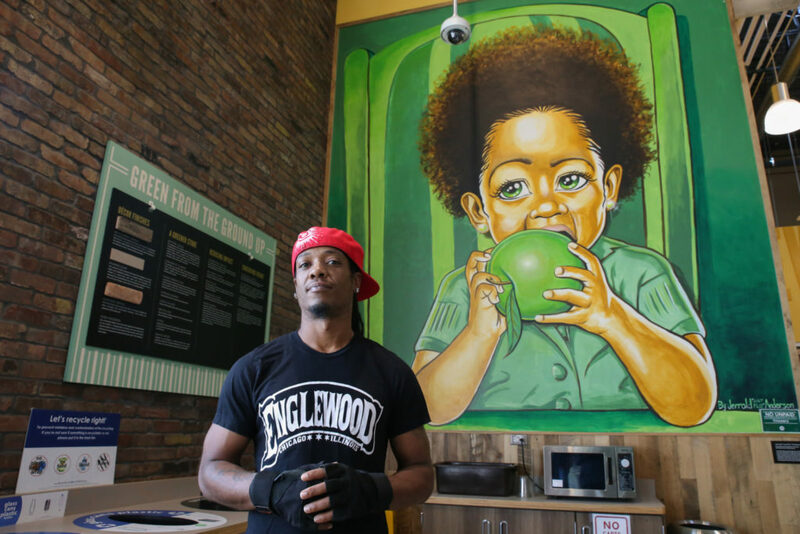 Jerrold “Just Flo” Anderson is a motivational hip-hop artist and speed painter living in Englewood. He specializes in poetry, rap, singing, live artistry, comedy improv, illustration, murals, and tattoos. His goal is to “create harmony and cultivate healing within my family, community, and throughout the world.” He has performed with local, indie, and major artists, including Nas and Rick Ross. Being a resident of Englewood for about decade now, I find it vitally important to encourage and uplift the balance and economic development of local families and the community—men, women and children, TOGETHER! The best parts of Englewood can be found in the diverse people and landscapes of our parks, libraries, schools, churches and community centers. I would love to see more local business support and family restaurants, bridging the cultural divides and celebrating healthy traditions. And as we work towards that collective goal, the most exciting factor is, I will be right here to show my children how to thrive in the face of adversity! So much can be learned and harnessed by watching the daily movements of the neighborhood, AND ACTUALLY INTERACTING—and with the help of social media, it’s easier than ever to connect with those in need. Through the Resident Association of Greater Englewood (RAGE) organization and Grow Greater Englewood, I have seen the massive amounts of love and fellowship we offer to our great city. Everyday is like a beautiful experience just waiting to happen. The “violence” that many speak of is mostly misguided youth, still struggling to find purpose in such an ever-changing environment. Those who stand up for our youth work ENDLESSLY and THANKLESSLY with very few resources and support. AND THEY STILL DO WORLDS MORE THAN THOSE WHO STAND ON THE SIDELINES AND CRITICIZE! We face many problems—both seen and unseen—in our streets, and it can be exhausting just watching so many outside of the community form opinions and judge, while ignoring countless voices, conversations, actions and solutions DAILY! The Englewood community is rich with opportunities and growth potential. In the eyes of every youth is a promise of future greatness that simply needs nourishing and nurturing. In the hearts of every elder is a soul full of wisdom that simply needs a humble hand or ear. Our young adults and parents serve as the “lifeblood” connecting generations—they need us all working together. My commitment, with the help of others, is to teach, heal, protect, and empower the history, health, families, wealth, artistry, and science within our children’s futures and our day-to-day lives. Through all the ups and downs, the Englewood community has a vast and strong history of struggle and progress and that journey continues today. Beyond the media and outside perspectives, beats the heart of the South Side, still finding its voice and balance amidst the chaos. So as we create harmony and cultivate healing, remember, it takes a village to raise a child—and it takes unity to sustain that Village—so I GLADLY stand as a bonding force! Englewood STAND UP! If you’re seeking some peace of mind on a late Saturday morning, consider achieving it through downward dog and warrior poses at one of Englewood’s community hubs. A group of yoga teachers offers free classes in the room adjacent to Kusanya Cafe every Saturday morning at 11:30am. 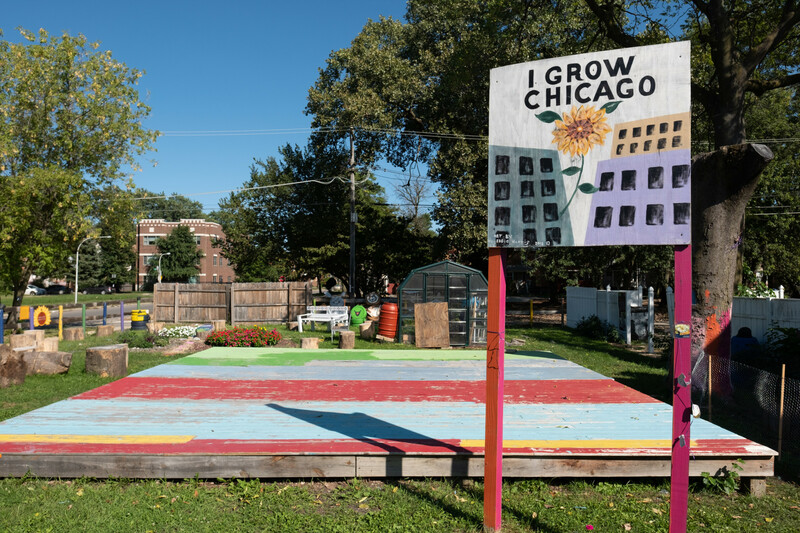 Classes are put on by I Grow Chicago, a nonprofit that aims to build community connection and opportunity in Englewood, and have been held for the last four years. The class I attended on a recent Saturday was taught by Lauren Daniel, a yoga teacher and Thai massage therapist. Daniel led a dozen attendees of all ages in a kundalini and yin yoga practice, starting with upper body stretches and leading into moves that opened up the hips. Given in a calm and affirming voice, Daniel’s instructions were accessible to beginners, and she offered additional options for more of a challenge. We concluded the class with breathing exercises and a few minutes of meditation. “We aren’t church, but showing daily faith in the community to come together doesn’t get more ‘faith-based’ than this,” says Tamar Manasseh, founder of Mothers (and Men) Against Senseless Killings. This summer, I joined a stream of pilgrims who enjoyed MASK’s warm fellowship, charismatic leadership, soulful music, and the indispensable fiber of American congregational life: ample potlucking and cooking out. My first time on the block at 75th and Stewart, a retired firefighter passed by the lot, conferred with Manasseh about her vision, and returned in a vintage fire truck blasting gospel music. This was but one of MASK’s daily signs and wonders. The gospel of MASK has been recorded in WGN, ABC, PBS, WBEZ, Reuters, the Tribune, the Sun-Times, Good Housekeeping Magazine, and in Manasseh’s op-eds in the New York Times. The miraculous claim: salving Chicago’s intractable gun violence, creating peace through the presence and commitment of community members, of mothers and neighbors. As MASK increasingly declares itself “a movement,” its vision of recognizing, nourishing, and engaging the young people Manasseh calls her “street dudes” has become more expansive. Manasseh’s project has become an explicit indictment of the city that killed Laquan McDonald and continues to deprive and lock up Black and brown youth; hope and trust in that Chicago has crumbled, so MASK will create their own networks of community and education through ingenuity and sweat equity. MASK has been stymied in its attempts to purchase the city-owned half of the lots they occupy through the Large Lots Program, though it should be easy, given that they are already stewards of the land. Over a summer when MASK provided daily sanctuary for out-of-school youngsters, tension has grown around the Englewood peacemakers. At the beginning of August, CPD deployed hundreds of additional cops. Manasseh warns of pending misunderstanding and violence, and urgently live-streams from the block to broadcast the sensory overload of over-policing to hundreds of online viewers. In the world centered on 75th and Stewart, CPD Superintendent Eddie Johnson’s announcement of a city-wide crackdown on block parties and street gatherings, signaled, at the least, a failure to notice the effectiveness of MASK’s “block hugging” and perhaps even a retaliation against Manasseh’s increasingly pointed public commentary. MASK embraced their new status as an “Unsanctioned Street Gathering,” and continued to congregate daily on the block, and Manasseh returned to the pages of the New York Times, pointing her finger at CPD. At the end of the summer, they held a show-stopping back to school party with horseback rides, a mechanical bull, live performances, and a giveaway of school uniforms and supplies. Last summer, Taylormade Que caught the attention of Englewood residents during its grand opening. The establishment—blasting music throughout the day while serving up delicious jerk and chicken tacos for all—was a welcome addition to the neighborhood. One year later, with new items coming to the menu regularly and prices staying put ($6.50 for three tacos), it looks like Taylormade Que is here to stay. The restaurant has evolved since it first opened. The head chef, Darrion Gill, has been actively seeking feedback and sharing his new recipes on Facebook, resulting in frequent and delicious changes to the menu. Unlike that first day, Taylormade is no longer offering its original jerk menu, however, in its wake you will find chicken wing dinners and family meal deals. 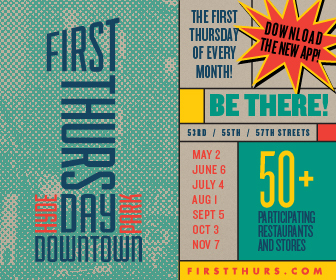 In the restaurant, one sign urges you to “Be Patient…Everything is made fresh.” Anyone walking down Halsted coming from Kennedy-King or going toward the 63rd and Halsted Green Line station has smelled the grill cooking up ribs, polishes, and jerk chicken tacos. Living less than five minutes walking distance away, Taylormade Que is a new must-have. I had the small BBQ ribs, which were tender enough that the bone slid away from the meat. The BBQ sauce was housemade, like the fusion jerk sauce, but lighter than most sauces, with a texture similar to a vinaigrette. The sauce was deceptively plentiful as it made its way through the meat to the fries. (Everything comes with fries.) Spending less than ten dollars and ending my meal by licking the wax paper under the food has put Taylormade Que up there with Uncle Joe’s and other South Side BBQ joints. Barbershops have long served as community forums, especially in Black communities. Powell’s Barber Shop takes that legacy seriously. 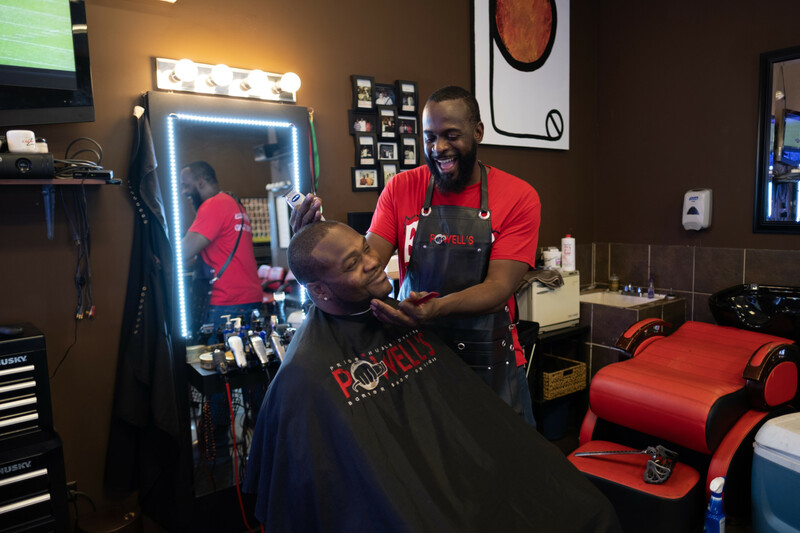 Plenty of haircuts are given in the red vinyl barber chairs, but owner Sunni Powell also sees his work as an opportunity to empower his neighborhood. Earlier this month, the shop gave sixty-three free haircuts to kids going back to school and gave away one hundred backpacks donated by Resident Association of Greater Englewood. A bookshelf in the shop is stocked with free books for kids. Powell hosts poetry readings and concerts. At the end of this month, he’s convening a group of barbers from across the city to talk about supporting each other’s businesses and coordinating voter registration drives in their shops. Powell is an Englewood native; his family has roots in the neighborhood going back to 1953. He’s lived in Atlanta and in LA, where he dated Kim Kimble, a celebrity hairstylist who has styled both Beyoncé and Mary J. Blige. Powell managed a shop with Kimble in West Hollywood for three years. When they broke up, Powell returned to Chicago. He saw a need for a professional barber shop in his neighborhood. So, nine years ago, he opened one. The shop was thriving in May 2016 when a man showed up and fired shots into it, killing one patron and wounding another. “That just changed everything,” Powell said. With the shop now associated with violence, business fell. Typically, it would have been time to close the shop and “go onto your next dream,” he said. Instead, Powell doubled down on his mission to make the shop a positive neighborhood space. Inspired by the movie Barbershop 3, he began holding annual “ceasefire” events, bringing in student barbers to provide free haircuts.